Pennsylvania Gov. Tom Wolf, left, and U.S. Senator Bob Casey, both Democratic incumbents, won their general election races handily on Tuesday. The top of the Democratic ticket sailed to victory on Tuesday, with Gov. 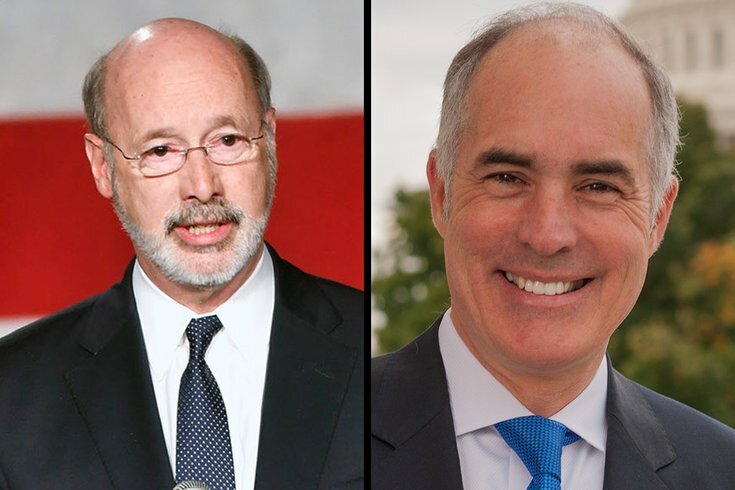 Tom Wolf and Sen. Bob Casey winning re-election races, according to the Associated Press. Wolf topped Republican Scott Wagner, a businessman from York County, to gain a second term in Harrisburg. Libertarian Ken Krawchuk and Green Party candidate Paul Glover failed to gain much traction in the race. Voters gave Casey a third term in the Senate, opting for the Scranton native over Republican Lou Barletta, who had received support from President Donald Trump. Libertarian Dale Kerns and Green Party candidate Neal Gale also ran. With 95 percent of precincts reporting, Wolf had received 57.7 percent of the vote. Wagner had garnered 40.7 percent while Krawchuk and Glover had accumulated less than 1 percent each. All results are considered unofficial. Wolf, 69, of York County, was elected alongside lieutenant governor candidate John Fetterman, who beat incumbent Mike Stack in the primary election. Prior to becoming governor, Wolf previously served in state government as secretary of revenue under former Gov. Ed Rendell and in economic development and urban schools under former Gov. Bob Casey Sr.
Wolf has degrees from Dartmouth College, the University of London and MIT and volunteered in the Peace Corps. He then went into his family's buidling-products distribution business, which he sold in 2015. Wagner, 62, of York County, stepped down as a state senator after he won the GOP gubernatorial primary. He owns waste-hauling and trucking firms in York County. Wagner started his first business two years after graduating from Dallastown Area High School in 1973. He won a special election for a Senate seat as a write-in candidate in 2014. Casey had received 55.7 percent of the vote, with 15 percent of precincts reporting. Barletta had received 42.6 percent and Kerns 1 percent. Gale had received 0.6 percent. Casey, 58, of Scranton, served as Pennsylvania's auditor general and state treasurer before being elected to the U.S. Senate in 2006. He called for a higher minimum wage and health care that covers more people and reduces costs. Barletta, 62, of Hazelton, represents the 11th District in the U.S House of Representative, having won the seat in 2010 after two unsuccessful bids. He helped found the Schools and Homes in Education (SHINE) afterschool program in Luzerne County. On the campaign trail, he stressed immigration issues and strongly opposed sanctuary cities like Philadelphia. The other candidates for lieutenant governor included Republican Jef Bartos, Libertarian Kathleen Smith and Green Party candidate Jocolyn Bowser-Bostick.